Qty Pricing for all BVL programs! 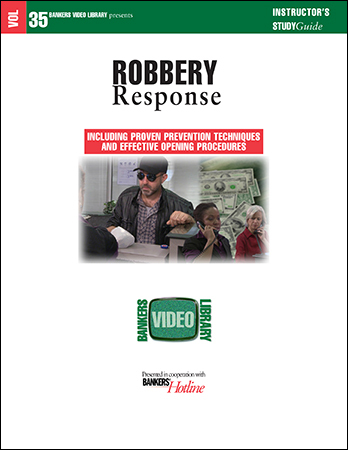 Annual training covering robbery response is easily accomplished with this up-to-date video training program. The totally, absolutely incorrect way to respond is illustrated before the efficient, calm, correct way is demonstrated by the same individuals. Trying to keep robbery response training "painless" and "different" has always been the goal for the security officer. Bankers Video Library helps do just that. We've also included the FBI's "Meet and Greet" suggestion that can be adapted to any banking office. Shipping & Handling is FREE, regardless of quantity ordered. Your DVD will ship within 1-2 business days and you will receive an email with instructions for downloading the accompanying material.